Exhaust leaks seem to be an all-too-common issue with most modded Subarus. They tend to spring up out of nowhere and cause hours of troubleshooting headaches. Compare our adapter to the competition and you will immediatly see why we offer the best solution to finally end that pesky leak. The most guaranteed leak you will get though is if you run an aftermarket 3” downpipe to an OEM or OEM like 2.5” Exhaust. The other most common leaks that we hear about is from running an OEM downpipe with an aftermarket 3” catback without a proper adaptor. 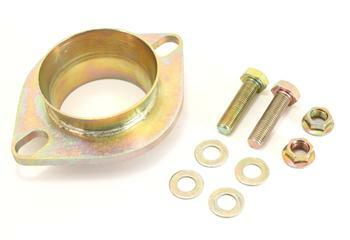 GrimmSpeed provides Downpipe Adapters to fix BOTH issues. Just make sure you order the correct part! Cut from Steel and hand welded these pieces were born tough. With the ability to work with both flat style gaskets AND donut gaskets they cannot be matched. If that wasn’t enough we flared out one end to just shy of 3” so that unlike the competitors, our adapter will not block flow! CNC machined from mild steel and zinc coated for durability and longevity, this thing will outlast your car. Don’t waste your time trying to get your OEM downpipe to seal without a donut gasket. In a short amount of time, they rust and corrode and will prevent you from ever getting a good seal with a typical flat gasket. Re-use your stock donut gasket along with a GrimmSpeed 2x Thick 3” Gasket (included) for a perfect seal on the first try!